Tenho muitos amigos que me chamam de feminista só porque gosto de pagar minha própria conta. Mas isso é apenas uma expressão da minha autonomia de vontade e independência, algo que prezo bastante. Eu, particularmente, não gosto do argumento de subjulgação que muitos utilizam como única base para o feminismo, causando uma revitimização. Uma coisa é certa: enquanto o machismo prega a dominação dos homens na sociedade, o feminismo clama por direitos iguais, por um equilíbrio que ainda está longe de existir. Mas isso não significa levar ao extremo e dizer que nós, mulheres, somos superiores ou deveríamos ser "anti-man" e contrárias a todas as tradições. Hoje em dia, ao meu ver, lutar pelo feminismo é lutar pela liberdade, em especial, a liberdade de escolha. Isso é tão precioso e ao mesmo tempo complexo de se lidar. O feminismo ao extremo não pode impor modelos, bem pelo contrário: deve prezar pela autonomia da mulher escolher o que ela bem entender. E ter todas as condições para fazer isso prosperar. Bringing women into senior management is first a matter of exploiting an existing and much-needed pool of talent: 60 percent of Europe’s university graduates are female. When Reding asked business schools to come up with a list of women qualified to sit on European corporate boards, they found, as someone once said, binders full of women: 8,000 of them. Yet resistance to putting them on boards continues throughout Europe. Women are needed to help corporations deal with an increasingly unpredictable business environment. We strongly believe that the more uncertain the world is, the more diverse you need the management to be, says Agnès Audier of the Boston Consulting Group. This diversity can come from different nationalities or simply different styles, but one of the most obvious ways to assure it is through different genders. And women are needed to help the bottom line. McKinsey & Co. consultants have shown a very strong correlation between the presence of women in the executive suite, a company’s positive sense of its own organizational performance, and its financial performance. Indeed, in one of its most recent studies, McKinsey found that most of the clients surveyed said the kind of management they wanted and needed in the crisis is the kind generally associated with women: shared decision making, adroit use of expectation and rewards, intellectual stimulation. Yet what many businesses have been getting since the crunch came is an increase in the my-way-or-the-highway management often associated with male bosses. Then there’s the question of how women are evaluated. It’s not about making it easier for women, says Devillard. It’s not, Oh, the poor darlings, they have difficulties; let’s lower the bar for them. It’s not that. It’s a question of whether the system is skewed to make advancement harder for women. If, for instance, leadership styles associated with men are valued over leadership styles often associated with women, that makes it harder for the women to advance. The striking gap between the responses I heard from those young women (and others like them) and the responses I heard from my peers and associates prompted me to write this article. Women of my generation have clung to the feminist credo we were raised with, even as our ranks have been steadily thinned by unresolvable tensions between family and career, because we are determined not to drop the flag for the next generation. But when many members of the younger generation have stopped listening, on the grounds that glibly repeating you can have it all is simply airbrushing reality, it is time to talk. A similar assumption underlies Facebook Chief Operating Officer Sheryl Sandberg’s widely publicized 2011 commencement speech at Barnard, and her earlier TED talk, in which she lamented the dismally small number of women at the top and advised young women not to leave before you leave. When a woman starts thinking about having children, Sandberg said, she doesn’t raise her hand anymore … She starts leaning back. Although couched in terms of encouragement, Sandberg’s exhortation contains more than a note of reproach. We who have made it to the top, or are striving to get there, are essentially saying to the women in the generation behind us: What’s the matter with you? Seeking out a more balanced life is not a women’s issue; balance would be better for us all. Bronnie Ware, an Australian blogger who worked for years in palliative care and is the author of the 2011 book The Top Five Regrets of the Dying, writes that the regret she heard most often was I wish I’d had the courage to live a life true to myself, not the life others expected of me. The second-most-common regret was I wish I didn’t work so hard. She writes: This came from every male patient that I nursed. They missed their children’s youth and their partner’s companionship. These women are extraordinary role models. If I had a daughter, I would encourage her to look to them, and I want a world in which they are extraordinary but not unusual. Yet I also want a world in which, in Lisa Jackson’s words, to be a strong woman, you don’t have to give up on the things that define you as a woman. That means respecting, enabling, and indeed celebrating the full range of women’s choices. Empowering yourself, Jackson said in her speech at Princeton, doesn’t have to mean rejecting motherhood, or eliminating the nurturing or feminine aspects of who you are. I would never return to the world of segregated sexes and rampant discrimination. But now is the time to revisit the assumption that women must rush to adapt to the man’s world that our mothers and mentors warned us about. Sim, nesse sentido podem me considerar feminista. 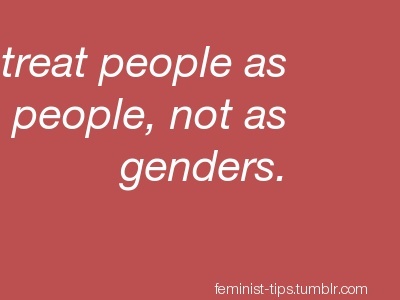 Sobretudo, gostaria de finalizar esse texto com a reflexão da imagem inicial "treat people as people, not as genders". Que não hajam modelos-padrão do que uma mulher ou um homem devem ser. Que ninguém precise encaixar especificamente em "ser homem" ou "ser mulher" como socialmente aceitável. A valorização do ser humano, em todas a suas formas de expressão no mundo, é o que deve ser proposto. Não somente um ideal vago de "Feliz dia das Mulheres", mas sim de respeito a todos. E que orgulho da nossa presidenta! “Faço um especial apelo e um alerta àqueles homens que, a despeito de tudo, ainda insistem em agredir suas mulheres. Se é por falta de amor e compaixão que vocês agem assim, peço que pensem no amor, no sacrifício e na dedicação que receberam de suas queridas mães. Mas se vocês agem assim por falta de respeito ou por falta de temor, não esqueçam jamais que a maior autoridade deste país é uma mulher, uma mulher que não tem medo de enfrentar os injustos nem a injustiça, estejam onde estiverem”. Este post foi publicado sábado, março 09, 2013, por Unknown sob uma Licença Creative Commons. What kind of free world are you running?